Payday loans are a form of high-cost short-term credit. They provide small amounts of credit, typically in the range of £50 to £500, with relatively high rates of interest of up to 1500% APR. They are unsecured loans, which means that they are not secured against an asset (like a house or a car), but are instead borrowed against future income. These loans are taken out over short periods, traditionally ‘until payday’ when they are repaid, although lenders are now offering longer term installment loans of up to 12 months. In the UK they are available from specialist lenders such as Wonga, Quick Quid and Sunny. By 2012 such lenders were issuing around 10.2 million payday loans worth £2.8 billion in total. Around this time, the industry received persistent and damning criticism from a number of campaigners, debt advice services and MPs. They accused lenders of exploiting people’s vulnerabilities, exhibiting predatory behaviour, carrying out irresponsible lending and charging extortionate lending rates. This led to regulatory change and a cost cap on payday lending. Despite new regulations, payday lending has continued to thrive and has taken advantage of changes in technology and website design to situate the practice as part of everyday life (see our ESRC funded Digital Interfaces and Debt project). The emphasis on quick and easy online loans came to dominate. Cash Lady, an online high-cost short-term loan broker, had a TV advert banned in 2013 because it was deemed irresponsible for its ‘Fast Cash for Fast Lives’ slogan. It was also criticised for using celebrity Kerry Katona as brand ambassador, a person whose financial difficulties and experience of bankruptcy have been well documented in the tabloid press. A year later in 2014, a complaint lodged by Citizens Advice led to the banning of a Wonga television advertising campaign. It failed to tell customers about the (pre-regulation) 5853% annual interest rate applied to its loans and implied that loans could be used for non-essential spending after one of the Wonga puppets uttered the words, “You appear to be in a financial quandary”, offering a Wonga loan as the solution. The puppets, which for many were symbolic of the pernicious way payday loans were advertised, were also soon axed. 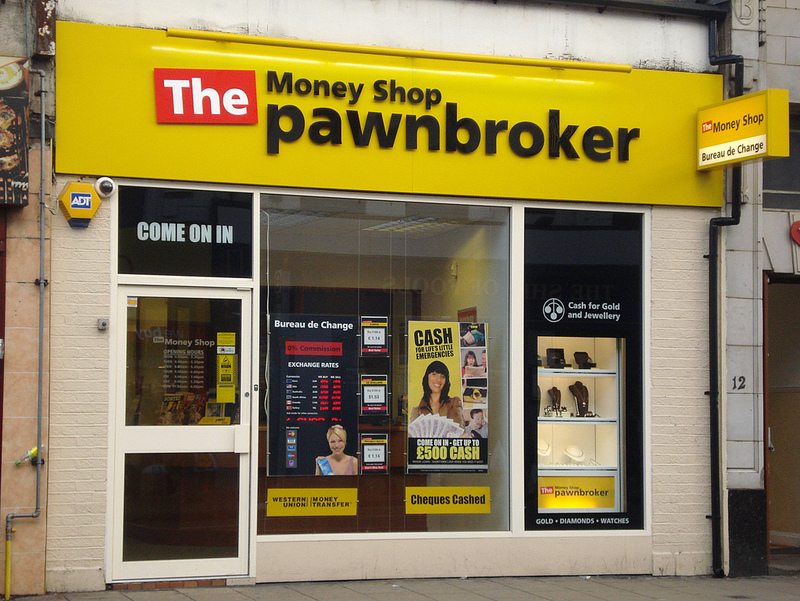 For payday lenders, the shift to online borrowing also meant that they no longer needed to operate a network of high street shops or call centres to sell loans to customers and process applications, which helped to minimise costs. Instead, investment was made in digital infrastructure, financial technology (‘fintech’), marketing and advertising. A whole suite of digital, marketing and sales products and services has grown around the payday lending market to exploit this commercial opportunity and further challenge the centrality of the banks in financial services. We know that many consumers now apply for high-cost short-term credit online through a digital interface. This led us to the payday loan website. The interface has undergone a number of iterations over the years, partly in response to regulatory change, but also due to the increased application of user experience principles, analytics and user testing as a way to optimise online experiences for consumers. 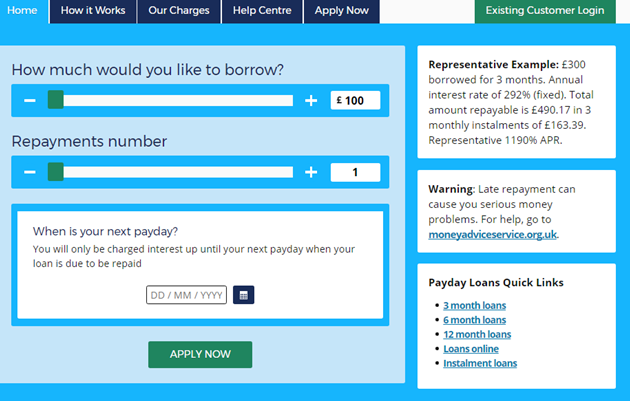 There is design uniformity across different payday lending websites, contributing to a recognisable ‘look and feel’. Perhaps the most iconic and integral element is the slider. Usually made up of two sliding bars, the slider offers the potential customer the opportunity to select the amount they wish to borrow and the term of the loan. The slider works in real-time and presents the customer with a dynamic calculation as they move the bars. Next to the slider, there is the ‘Apply Now’ button. This starts the loan application process. The accessibility and immediacy of credit is a significant part of how payday lenders market themselves. Rather than the user having to select an amount from a drop-down box or entering a value using the keyboard, they engage with a single and smooth sliding motion. This is about making customers feel comfortable and ‘at ease’ as they engage with the application process. The use of colour, copywriting and imagery featured in their descriptions of how this was achieved. For example, photography of everyday scenes, like someone sitting down for a cup of tea in the kitchen or a person at work in an office, were used to make the act of applying for credit online appear familiar, relatable and easily attainable. This attempts to create feelings of acceptability, whereby the use of high-cost short-term credit is a normal and ‘okay’ thing to do. It is particularly important to minimise any worries or concerns the consumer might have about using this type of credit, especially given the negative media attention the industry has received. What is it like to have a payday loan? Many lenders will tell you that a typical customer takes out a loan in the event of the unexpected – an unplanned bill, a car repair, a new boiler. Whilst this may be the case for some, it fails to give us an insight into the lived experience of payday lending and, more broadly, the embodied and increasingly digitised life of credit, debt and money – budgeting, online banking, online shopping, applying, managing, juggling, saving and repaying. People told us that they applied for a loan at home in the kitchen or while they were in bed at night, during their lunch break at work, whilst travelling on the bus, at a rugby game, in the pub on an evening, on holiday or whilst shopping in town. Some people told us how important it was for them to manage their finances online using personal digital devices. For some, this was a matter of anonymity and privacy. By dealing with lenders online, they did not have to apply in person or over the telephone and have to discuss their money matters with someone else. This helped people to deal with feelings of embarrassment about taking out a loan; for others, it meant they could avoid judgement. The use of personal devices was also significant. Rather than having a paper trail of receipts or loan letters, much of the communication between borrowers and lenders was done via text message or email, all managed on mobile phones or tablets. For some, this was a discrete way of managing their day-to-day finances. Their use of loans could be hidden from others. Keeping their use of high-cost short-term credit a secret from family and friends was bound up with feelings of embarrassment and guilt about their ability to manage their money, especially when using products deemed to be ‘sub-prime’ in nature. However, sometimes the communication from lenders became intrusive and capable of inducing anxiety for the people we interviewed. In cases where a borrower’s ability to meet repayments became problematic, communication could become a constant reminder of the debt owed, punctuating everyday life. The growth in online payday lending has helped to transform the availability and accessibility of credit. Much has been done in terms of regulating the cost of credit in the payday lending market, although lenders are finding new ways to maximise the commercial return of loans. For example, many lenders are offering instalment or flexible loans. These loans can be borrowed over periods much longer than the traditional payday loan which was ‘until payday’, with some offering loan terms of up to 12 months. The market therefore requires continued scrutiny. In 2017, the wider consumer credit market, including bank overdrafts and rent-to-own agreements, came under investigation by the regulator because of high costs for consumers and lack of clarity over the total cost of credit. But there are other issues at play here that go beyond the cost of credit and are not so well understood. The availability of credit at ‘any time or any place’ via personal digital devices is a concern. It highlights the persistent inequality of access to affordable forms of credit for all people in society – and the potential harm it can cause consumers when credit is tied to everyday circumstances and part of everyday finances. Aitken, R. (2018) Fringe Finance: Crossing and Contesting the Borders of Global Capital. London: Routledge. Langley, S. (2009) The Everyday Life of Global Finance. Oxford: Oxford University Press. Soederburg, S. (2014) Debtfare States and the Poverty Industry: Money, Discipline and the Surplus Population. London: Routledge. Aitken, R. (2010) ‘Regul(ariz)ation of Fringe Credit: Payday Lending and the Borders of Global Financial Practice‘, Competition & Change, 14: 2, pp. 80-99. Ash, J., Anderson, B., Gordon, R. and Langley, P. (2017) ‘Unit, Vibration, Tone: A Post-Phenomenological Method for Researching Digital Interfaces‘, Cultural Geographies, online first. Langley, P. (2014) ‘Consuming Credit‘, Consumption, Markets and Culture, 17: 5, pp. 417-428. Citizens Advice (2014) Payday Loans Campaign, September 2012 – April 2014. Competition and Markets Authority (2015) Payday Lending Market Investigation: Final Report. Financial Conduct Authority (2017) High-Cost Credit Feedback statement. Office of Fair Trading (2013) Payday Lending: Compliance Review Final Report. StepChange (2015) Payday Loans: The Next Generation.